I never really liked love stories. I always thought they were so distanced from life itself. Recently, though I had the chance to read a short story, the dedication for which warmed up the heart of this non-believer: – “…the strength of true love is in its endurance, not in its fiery fickleness”. 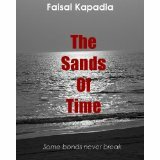 The Sands of Time, written by Mr. Faisal Kapadia, a writer, blogger, and now an author of the captioned novella, from Karachi, Pakistan. The book starts with an impressive preface by the author, whose patriotism glimmers through his words. Pakistan, in the current times is marred with blood and chaos – each day bringing one bad news to another. And yet, the author reminds us of the great potential of this land, which ‘speaks out’ to him, and this he says, is one of the stories from the land. This tale starts near what seems to be the centerpiece of the whole story, the sea where one finds the main character, Saleh, in his adolescence. It is the story of this young crab seller that the writer weaves into the rich landscape that life is in and around the city of Karachi. The rise of this boy through his years marked by circumstance love and evil around him runs in parallel to the story of a girl called Laila belonging to part of the city’s posh class who grows up & finds the man of her dreams but along the way has just two encounters with Saleh which change her life forever. The fact that the writer has the gift of transporting the reader into situations he narrates so well with his words is only elevated by his grasp of the local lingo and mannerisms which are part and parcel of this book rather than looking like forcefully inserted references which some use to make their books sound more rooted to the ground. This book lives and breathes the unending energy and darkness that can be found in Karachi and the people which go through its fast paced life before disappearing into it to emerge the next morning ready to run again with the waves that lap its shores. You would find yourself chuckling in delight at Saleh’s clever humour and at times gaping in horror with a swift change and the shuffling of words which the author does so aptly. Every page is vibrant with action, and each character has a distinct personality and aura that speaks for itself. The story is sprinkled with all the right ingredients of a life of an ambitious man, the darkness glinting and interspersed well with the Saleh whose heart beholds the love of his childhood’s dream, – a love that withstood all the tests of time. The story is titled the Sands of Time because true love, is after all, eternal in its core. Like the two connected vertical glass bulbs of an hour glass, the Sands of Time runs the story of Saleh and Laila in parallel and yet their story is deeply connected. It is with deliberate intention that I shall refrain from describing the plot of the story further. How else will you go online and buy it? What also swelled my heart with pride was the recognition that a Pakistani writer was able to sell his book on the largest US online retailer ‘Amazon’ – http://www.amazon.com a ‘market place’ that offers many products including books in hard cover and the recent ‘Kindle Edition’ ebooks. Mr. Kapadia’s novella is available in the books section, you can search by author name, book title or simply click here. With the social media savy new face of Pakistan’s emerging readership, it should not take more than five minutes to download the ‘kindle version’ of this ebook in your desktop or your laptop – straight from the website. The author writes in end to the preface, ‘…sometimes it is not the destination but what one witnesses along the way that matters…” an apt way to describe the brilliant, quick and profound journey this piece of writing takes you on, let us hope there are many more such stories to come from the writers quill in the near future. I want to know if you will hire a writer for your blog? In your review I find the quote you mentioned “…the strength of true love is in its endurance, not in its fiery fickleness” quite admirable, since I never came across this quote I would like to ask if it is yours as I feel like using this as a “quote” for my own use. I saw your name in a tweet by humor-carbon and again this name comes across ringing a bell, not sure if you are an author or is that in some other context but it surely sounds very familiar. couldn’t find this book on Amazon I guess they have taken it down.